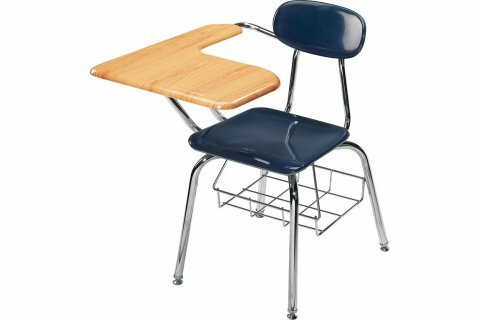 These chair desks are sturdily constructed using high-quality materials. 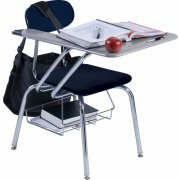 Their 16-gauge chrome-plated steel frames support 5/8"-thick hard-plastic chair seats. Exclusive Academia WoodStone tops makes these desks an excellent value. WoodStone has the scratch and stain resistance of hard plastic, but costs and weighs less. Extra-Durable: Exclusive WoodStone top resists stains, scratches and dents for a truly durable desktop. Great Value: WoodStone offers you the strength and resistance of hard plastic, at a much lower price. Tough: 16-gauge steel frame with 14-gauge steel back supports. Desktop is supported by twin 14-gauge tubular steel brace. Convenient Storage: Attached bookbasket offers easy access to notebooks, papers, and textbooks.